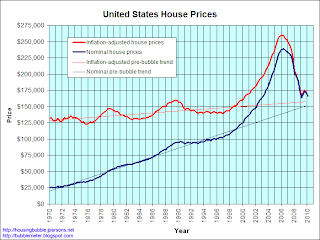 It is interesting and disappointing how our best economists and advisers failed to see this massive rise in housing prices. At any rate, the bubble occurred and popped quite violently just a little under 2 years ago. 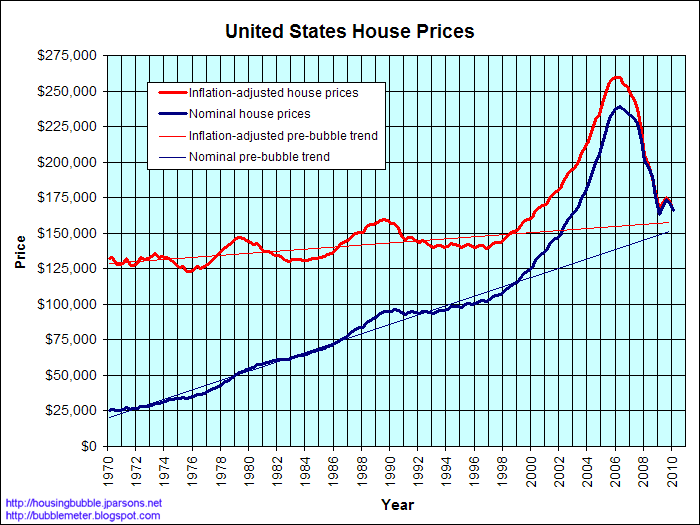 Bubbles have long been a phenomenon of capitalism and have been the focus of fiscal and monetary policy for decades. The government's (treasury, fed, congress) goal is to smooth the business cycle and prevent bubbles or at least hamper them from getting too big before popping so as to prevent a total collapse of the economy. Sometimes, however, policy can do the opposite. Low interest rates and increased incentives to lend helped spur the taking on of debt in the form of mortgages on the consumption side and loans to build houses on the investment side. Businesses kept building houses, and people kept taking on debt to pay for them. Banks continued to allow these risky lending practices and no one stepped in to stop it. Bubbles can't be prevented as long as there are risk-taking entrepreneurs and people or banks willing to fund their risks. Policy can help deter these bubbles through careful discretion and the tightening of credit, but even the best of intentions can have unintended consequences, i.e., it may deter the current bubble but unintentionally and unknowingly fuel another one. Housing prices have fallen substantially since the peak of the bubble, but because we are in a jobless recovery, they will probably fall further until Americans can return to work and catch up with their debt.